Scientific noun: Valeriana officinalis L.
Habitat: We find it in woods, riversides and humid grasslands. Perennial herb till 2 m.tall. Erect, robust stem, glabrous or pubescent, grooved. Pinnate compound leaves. Upper ones with shorter stalk or unstalked. White or pink flowers clustered in flat inflorescences, a central one in a higher position than the two side ones. Tubular calyx till 2.5 cm. long. Spring and Autumn are the best seasons to pick the roots of the plant. Clean and leave them to dry in a aired place. – Sedative: Against any type of nervous disorder – palpitations, spasms, vomiting, nervous breakdown, anxiety, depression, postpartum depression, premenstrual syndrome, schizophrenia, etc. It eliminates anxiety and promotes sleep in fibromyalgia – Infusion of about 15 grams from the root which has to be left in water all through the night. – Anti-inflammatory: Put a compress soaked with the infusion of dry roots on any swollen part of the body. 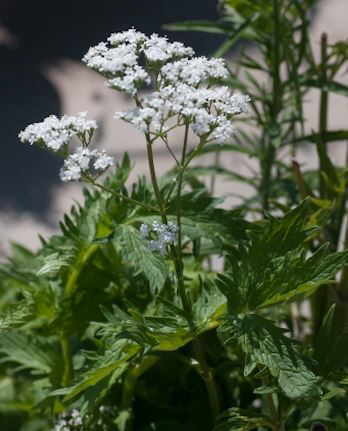 – Alcoholism: Common valerian helps to reduce anxiety and is a sleep disorders remedy. – Bulimia: It can be useful as a tranquilizing plants to reduce anxiety associated with this disease. Pregnant or nursing women should not use it. It can not be used for children under 3 years. It can cause adverse reactions if administered just before going to bed. It is better to take it a couple of hours before. Some people may experience allergic reactions to this plant. External application of essential oil is never recommended for pregnant or nursing women or for children under 10 years old. Do not apply externally on people with respiratory allergies. Its continuous usage may create a certain dependence. It is better to stop for 15 or 20 days after taking it for 10 consecutive days. This plant has depressant properties and it should not be used when the affected people have sleep apnea.